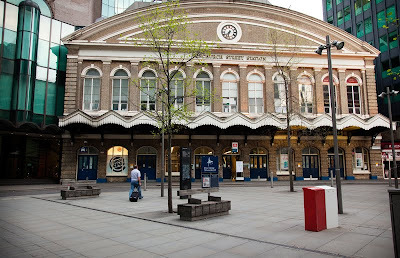 The first station constructed inside the city (that is the square mile known as The City of London), opening in 1841. One of the smallest train stations yet one of the busiest. All those city boys pouring into the banks each day to make their big bonuses. This station doesn't link to the underground. Nearly had the jubilee line go through when that was constructed in 1999, but politics got in the way and it didn't eventuate. It is however just a weeny walk to Tower Hill that is a tube station. Now blogger deserves a go to jail card in our game as they have been out of action for more than 24 hours. They are still trying to recover yesterday's postings. Fancy losing Bond St! All those millions. Don't worry I will bring it back if they haven't recovered it by tomorrow. I wonder what made them choose Fenchurch Street? I've probably walked by here but I can't remember it. If blogger lost Bond Street I'm sure heads would roll! Blogger deserves a 'stay in jail' a while longer! Glad to see Bond Street was back (even though I still can't see a lot of OP photos, including this one). A lovely building, I love old train stations!